An Industrial IoT platform that monitors and improves factory floor production efficiency. Eliminate bottlenecks and empower workers with real-time machine connectivity, visual dashboards, and predictive alerts. 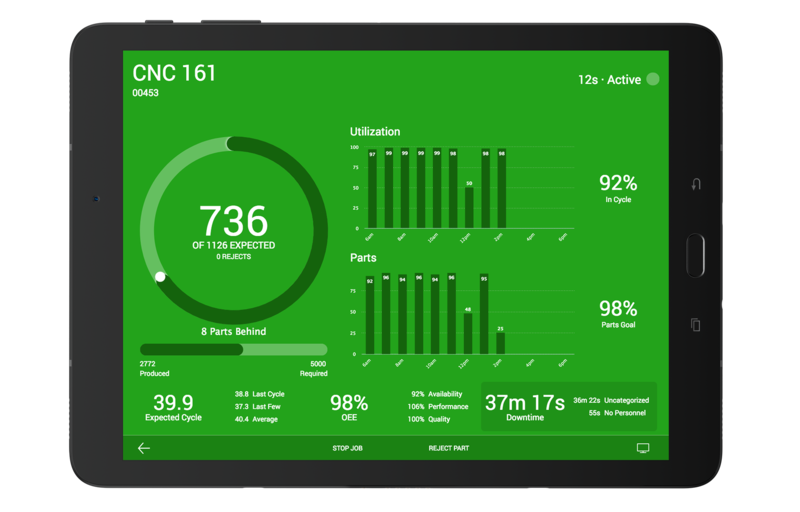 MachineMetrics Production brings Industrial IoT to your shop floor: featuring simple “self-install” IIoT connectivity, our fully automated cloud machine monitoring & OEE software connects to all machine types to provide visualizations of real-time manufacturing production data. Poor production visibility and manual data entry lead to inefficiency and delays. 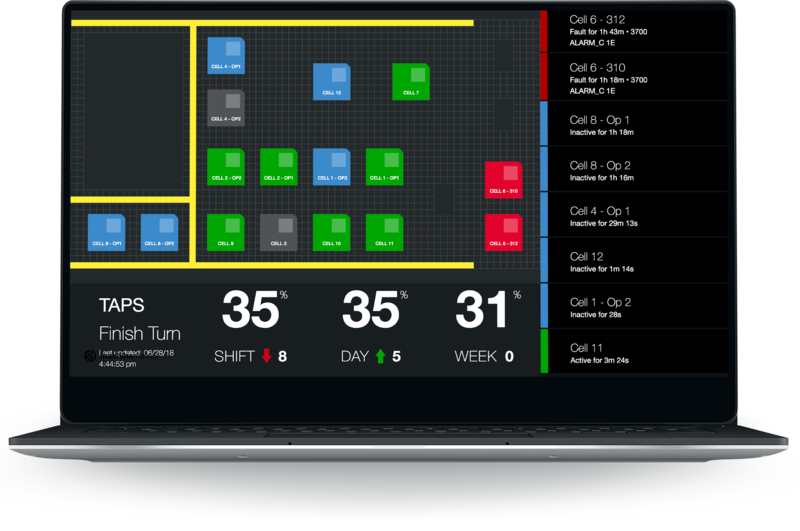 Visualize Production with customizable real-time dashboards that empower factory floor workers to meet production goals. Real-time machine condition monitoring helps diagnose recurring problems. Historical performance and production analytics help determine if jobs will be delivered on-time. 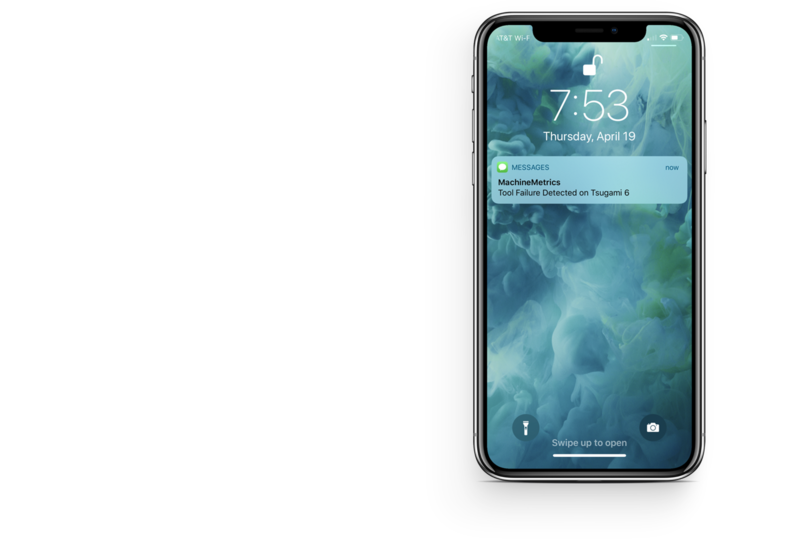 Predictive notifications allow the right person to take immediate action. Connect to any modern CNC Machine Tool by connecting the MachineMetrics Edge to the ethernet port of the control. Software on the edge processes data from the machine in real-time and streams the data securely to the MachineMetrics cloud. Other machine types and older equipment can be connected directly to the cloud with the Digital and Analog IO module. Configure remotely using a simple scripting language that anyone can learn. No need to be a controls engineer to build advanced connection logic. View and manage the status and health of your machine assets. Easily add new assets. View and export real-time machine data and alarms as time-series data and charts to help diagnose and resolve problems. 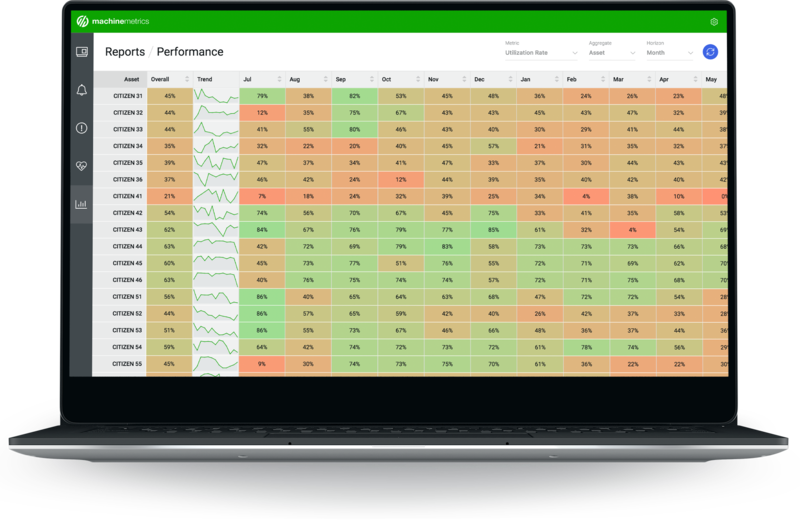 View machine utilization by hour, shift, day, week, and month to view trends to uncover opportunities for improvements. Alert the right person at the right time when action needs to be taken. 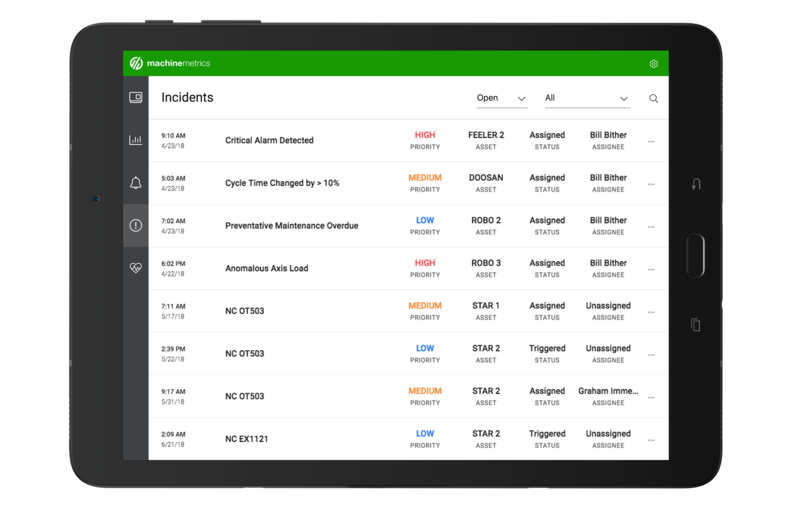 Track incidents through a workflow with reassignment, resolution, with full audit tracking. 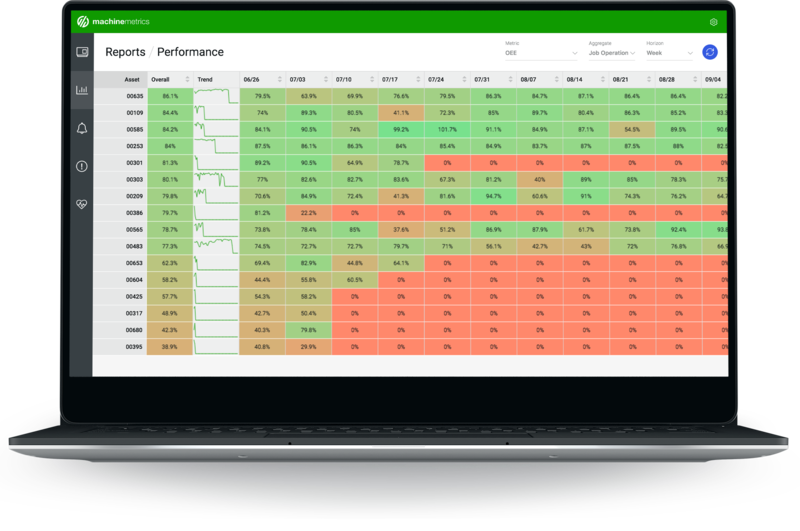 Visualize machine status and production efficiency in real-time with dashboards that include simple color-coded tiles. Provides transparency across the factory floor that empowers works to meet goals. Typically viewed on large screen TVs mounted above each manufacturing cell. 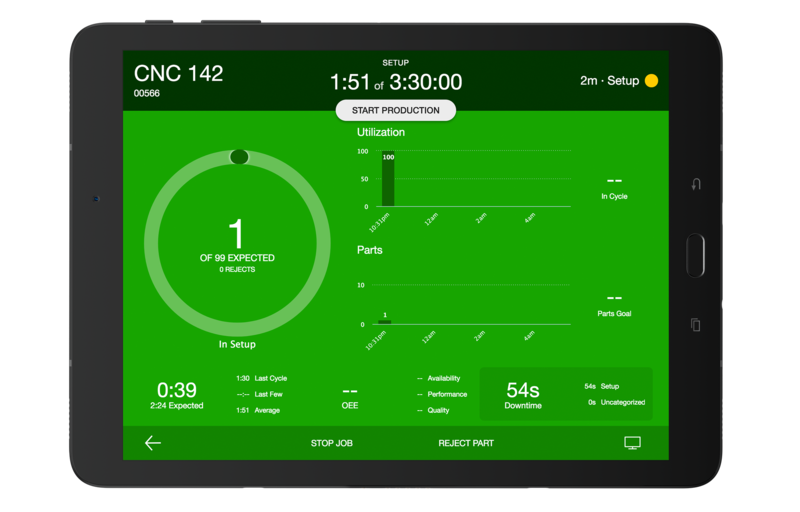 Allow operators to add human-context to machine data with a touch screen interface mounted right at the machine tool. Categorize downtime, reject a part, and start/stop jobs right from the machine to manage and record quality data. 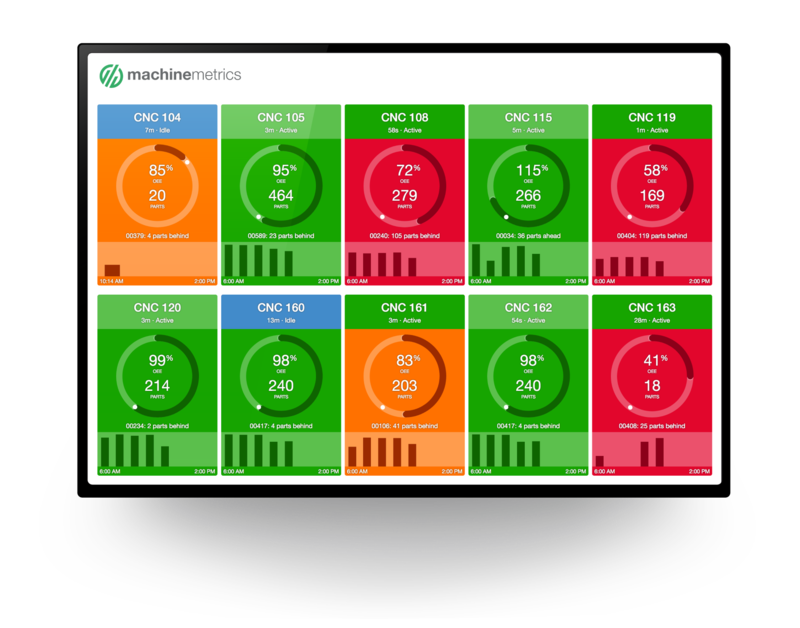 Build custom dashboards that display machine status, alarms, performance and other KPIs with MachineMetrics open APIs. When a monitor triggers an alert, a text or email message is sent to the appropriate person to take immediate action. MachineMetrics includes many monitors that trigger alerts including downtime, alarms, OEE Performance, and tool failure prediction. Incidents can be created that can track an issue through a workflow. 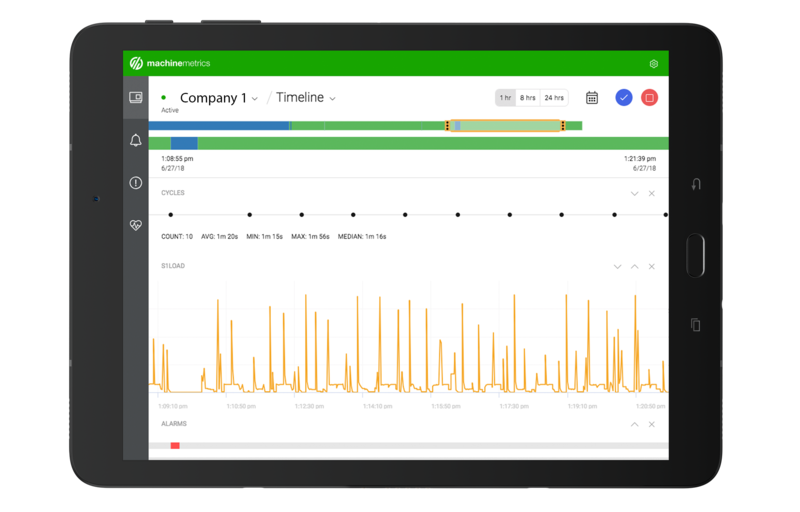 Track downtime from alarms or from the operator view and display a Pareto chart for any period of time that highlights the bottlenecks that are generating the most downtime. 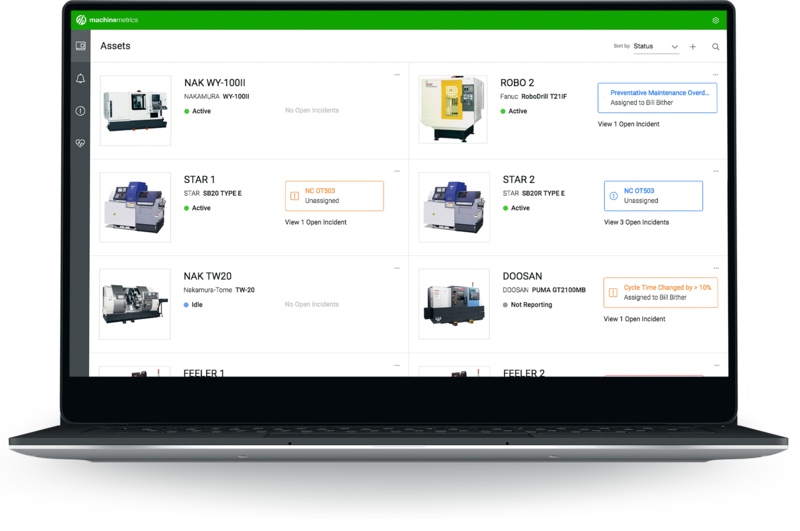 Track the performance of each job that is running on your equipment with job, part number, and operator analytics. Understand actual cycle times, performance between shifts, actual OEE metrics, operator performance, setup times, etc. Shops will often changeover jobs frequently, and this can be the biggest source of lost production time for a business. Setup times for the same job can vary wildly by operator, or by shift. Only by tracking setup time can this be improved. Operator View will display the remaining setup time, encouraging operators to complete on time. 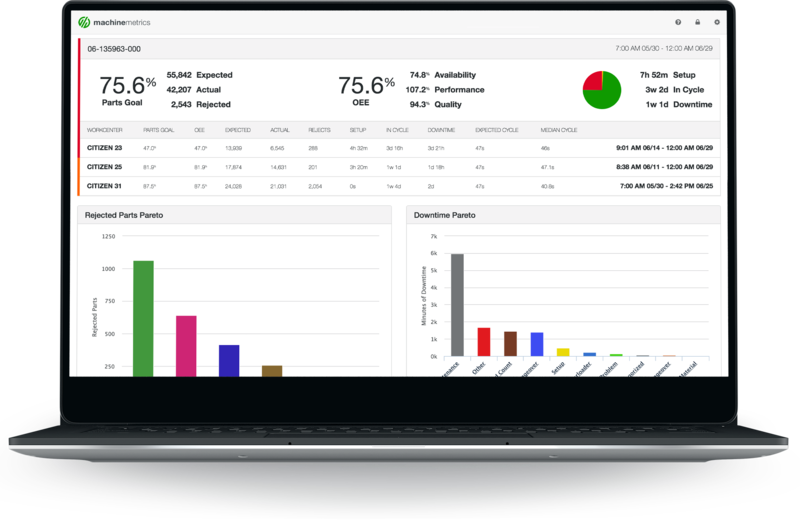 Real-time automated OEE reporting is available in various reports including the real-time dashboard, historical reports that can be compared by shift, and when viewing individual job/part reports. Integrates with any ERP to eliminate double entry. Get visibility into your production. Reach out to our team and get started today.